Corinth was one of the largest, wealthiest, and most powerful cities in the Roman Empire. It enjoyed a strategic location astride the narrow isthmus of land that connected the northern 2/3 of Greece with its southern 1/3 (the Peloponnesus). Destroyed by the Romans in 146 B.C., it was rebuilt by Julius Caesar a century later and soon regained all its lost wealth and more. Caesar made it a “colonia,” which brought in military personnel and military retirees who were promised land as part of their military pension. At its height Corinth may have had a population of 200-250,000 free persons and twice that many slaves. Obviously Corinth controlled all north/south land traffic through its isthmus, but it also dominated east/west shipping. Since sailing south around the Peloponnesus was so dangerous, engineers built a tramway with wooden rails and rollers for dragging smaller ships across the isthmus from one port to the other (Cenchreae and Lechaion). That “shortcut” from one side to the other proved so valuable that in 1893 a miniature version of the Panama canal was finally dug. Ships can now sail directly from the Aegean Sea to the Ionian Sea through that canal. A dazzling and unique strategic asset to the city was the Acrocorinth, an 1880-ft. tall stone mountain with steep sides sitting right in the middle of the isthmus. The fortress at the top was impregnable and was never taken until the age of gunpowder. Its flat top supported its own small town, featuring the Temple of Aphrodite (“Venus” in Latin), the goddess of love. There 1,000 female (and some male) sacred prostitutes offered their services. Corinth also featured temples to Zeus, Poseidon, Apollo, and many others. Although intellectual and artistic leadership in Greece belonged to Athens, the Corinthians had their own claims to fame, among them the ornate capitals in their architecture (i.e. the decorated tops of stone columns supporting ceilings and roofs), which came to be known as the Corinthian Order. The city was the site of the Isthmian Games, and the Corinthians’ fondness for sports perhaps prompted Paul to use boxing and track imagery in I Corinthians 9:24-27. Its wealth, pleasures, and high cost of living made it the standard of reference for a gathering place for high rollers. To “live like a Corinthian” meant living in the fast lane. The account of the founding of the Christian congregation in the city is told in Acts 18:1-18, an important part of St. Paul’s second missionary journey. It would have been around the year 50 A.D., and the work was so successful that uncharacteristically he stayed a year and a half. Paul probably stopped there as well on his way through Greece on the third journey, though Corinth is not mentioned by name (Acts 20:2-3). 3. The diversity of the congregation. As with urban churches throughout the Christian era, the congregation was blessed with and had to struggle with a diverse membership. There were racial Jews and Gentiles, Latin-speakers and Greek-speakers, slaves and free men and women, lifelong believers in the God of Israel and newbies to the faith. Some were citizens of the Empire, some were merely residents, and Corinth undoubtedly also had people living there and or passing through who were “barbarians,” people from outside the Empire’s boundaries. I Corinthians was written from Ephesus on the third journey, in response to a report on all the problems in Corinth brought by three messengers: Stephanas, Fortunatus, and Achaicus. In addition to the quarreling and party spirit, there were challenges to Paul’s authority, unrebuked open immorality, bitter lawsuits between members, confusion on the limits of Christian freedom, and confusion about the comparative value of marriage and the single life. Paul A Jew from Tarsus on the south coast of the Anatolian peninsula (Asia Minor), educated in both Hebrew studies and Greek culture, an intense Pharisee who persecuted Christians in his early life and was then converted to Christ by a personal appearance of the resurrected and glorified Lord; became the leading evangelist to the eastern half of the empire and honored by God as the chosen author of 13 letters in the New Testament. Sosthenes Lay leader of the Jewish synagogue in Corinth, seized and beaten by a mob; appears to have come to faith in Christ and lent his support to the content in Paul’s letter to the congregation. Chloe Her parents gave her a name (“green grass”) that was a nickname for Demeter, the Greek goddess of agriculture and growing things. She appears to have become a Christian and an influential one at that; it was people from her household who produced the report on all the problems in the Corinthian congregation that led Paul to write I Corinthians. Apollos A bright and talented Egyptian Jew from Alexandria on the Nile delta. The city was known throughout the empire as a place of scholarship; its library was world famous. A place where all the cultures and languages of the eastern Mediterranean came together. Apollos (named for the Greek sun god) was educated thoroughly in the OT Scriptures, and at some point he came to faith in Christ. He made his way to Ephesus, speaking boldly about Christ, but needed further mentoring from Aquila and Priscilla. The Christians in Ephesus decided to send Apollos to Corinth to bolster the congregation there. He was a vigorous proclaimer of Christ, demonstrating to those who stayed in Judaism that Christ was the perfect fulfillment of all the OT had said about the Messiah. A powerful leader, he attracted his own followers, especially among those who had issues with Paul. Sensing that his presence in Corinth was becoming divisive, he left and joined Paul in Ephesus and went on to serve as Paul’s agent in other places. Cephas None other than Simon Peter himself. His parents had named him “Simon” (also spelled “Simeon”) after one of the twelve patriarchs of Israel. Jesus called him to be one of the Twelve and gave him a nickname to be used when he demonstrated leadership and understanding: “Petros” means “rock-man.” “Cephas” is the Aramaic (late Hebrew) way to express the concept of rock. Crispus His name means “Curly” in Latin. He was a leader in the Corinthian synagogue and became an early convert to Christ with his family. One of the few to have been baptized personally by Paul. Gaius An unfortunately extremely common Latin first name in Roman times (it was actually Julius Caesar’s first name). Besides Gaius of Corinth there are three other Gaiuses in the NT (one from Macedonia, one from Derbe, and the addressee of III John). Our Gaius must have been well-to-do, for his home was big enough to be “host to the whole church” (Romans 16:23). He must have been a very early Corinthian convert to have been baptized personally by Paul. Stephanas A Corinthians believer who was one of the few people baptized personally by Paul; he and his family were the first converts to Christ in Greece (I Corinthians 16:15). He and two associates brought the report to Paul in Ephesus. Paul valued their gifts and urged the congregation to follow their leadership. The congregation was still in its early stages. It was perhaps only about six years old. It was a tiny little group struggling for survival in this huge, noisy, sensual, pagan metropolis. It should still have been in the first glow of planting and growth. How could it have grown so divided that its rifts and party spirit were the first problem Paul needed to address? The appeals to various Christian teachers (Paul, Cephas, Apollos) for justifying separate factions were just a smokescreen. This congregation, like every congregation, ours included, was under Satanic attack. The devil probes for weakness in individuals and organizations. Cut off from the peace and joy of God himself, he hates believers and their churches who enjoy what he will never again experience. His evil whispers created divisions and resentments in what was supposed to be a happy family. What was really going on? cliques. Has there ever been a group on earth that didn’t have multiple mini-groups within the main group? Has there ever been a group of sinners that didn’t have gossip floating around? The path to healing begins in my own heart. When there is conflict, I always start with myself—what are my own flaws, weaknesses, shortcomings, failures, misunderstandings, and yes—sins—that are leading to this disunity? If I just blame others, I may very well be amplifying the very disunity that I say I deplore. If I ask the opinion of those around me, and of those “on the other side,” I will soon enough hear my part in the conflict if I am listening. The path to healing follows the path of Christ to the cross. On the cross my sins were nailed; on his Son God’s wrath was poured; from the cross Jesus spoke forgiveness to the very people who were torturing and killing him; from the cross God’s free and full forgiveness flows into my life. v.7 Believers are gifted people. We have been given everything we need from a gracious and generous God to carry out our part of his agenda. v.10 We are all called to strive for agreement in belief and attitude, perfectly united in mind and spirit. v. 17 God’s Word is our final authority—it has all the wisdom we need and all the power we need. 1. Seeking to get Christians together in the same religious organization, denomination, or ecclesiastical structure. Christians of every age need to perform a balancing act with regard to religious organizations/denominations/church bodies/ecclesiastical structures. On the one hand, church fences can be needlessly divisive, make Christians look like petty squabblers, wasteful of resources and inefficient, unnecessarily excluding people from fellowship, programs and services, and respect. Every individual Christian will function better in a fellowship; every fellowship that is separate from others will have to justify that separation to God. On the other hand, people have always been flawed sinners, are now, and always will be. Their organizations are, too. When there was no “competition,” when one ecclesiastical organization exercised a total monopoly on religious authority, that was not good for the church either. Reforming truth tellers were persecuted, religious wars were launched in the name of Christ which served neither him nor the faith, and people were driven from Christianity. The diversity of religious organizations today can act as checks and balances on each other; different groups have been given different gifts of God. There would be no spirituals, blues, or black Gospel music if black folks were just a minority in white congregations…. Whatever you may think of its theology, the Pentecostal movement has unleashed the power of the laity to teach and witness and has brought the doctrine of the Holy Spirit to the front. 2. Bringing non-Christians into the Christian faith and into a Christian congregation. The worst kind of human disunity is when people pursue materialism and personal aggrandizement at the expense of other people’s lives. The greatest gift a Christian can give a non-Christian is a clear and compelling and inviting description of life with Christ, both on earth and in eternity. As leaders in Christian organizations, when we look at each other too much we find fault and fight. We need to direct serious energy and agenda time to connecting with people who are on their way to hell. Far more important than getting everybody into the same denomination is getting people to believe the Bible’s clear message about Christ. Membership in an organization does not get you through the Judgment and into heaven. Only faith in Christ can do that. 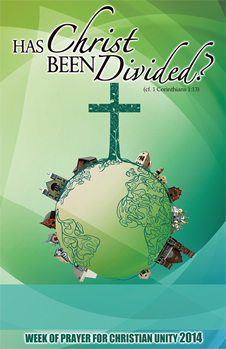 You can bring about Christian unity between people even when they are members of different denominations. We can season each other and help each other across fences. The Word of God is more important and more urgent than the constitution of my denomination. Diversity of religious experience and religious organizations will be a fact of life in our lifetimes and probably until time ends. We need to know how to use God’s Word to develop a coherent set of beliefs, but we need also to learn how to relate to people with whom we disagree. Or who disagree with us. Or whom we are not yet understanding, or who are misreading us. It is far easier to criticize and condemn than to listen and look for good. It is far easier to cut than heal; far easier to break than mend. Healing division is hard work. Clement of Rome, writing about 95 A.D., wrote that the Corinthian congregation was still known for its party spirit! The best leaders, the ones I have loved to follow, whose leadership I respected and loved, were good at these things: listening, cheerleading, praising, working behind the scenes, making other people look good, finding alternate paths when a brick wall loomed, having many friends, modeling a willingness to admit wrong, having a humility of spirit, and saying Thank you. Do you have personal stories of how you have been patronized or disrespected by Christians from other denominations? Do you have personal stories of how in your own past you were judgmental or jumped to wrong conclusions about Christians from other denominations? Do you have personal stories of how another Christian helped you to be kinder, gentler, more patient and understanding of other believers not like you? Note some paradoxes—the need for balance. It is a great blessing to grow up in and learn from denominational schools. But that blessing always comes with the risk of “straw man” arguments about the beliefs of other Christians who are not there to defend themselves and their line of thought. I’d like to invite you to pray personally, and perhaps lead others in praying, the famous Prayer of St. Francis. Actually it almost certainly was not written by Francis, the 13th century saint from Assisi. The first known appearance was actually in a little prayer booklet in French in 1912. But it is a terrific prayer anyway for people interested in being useful to the Lord as peacemakers and unifiers.